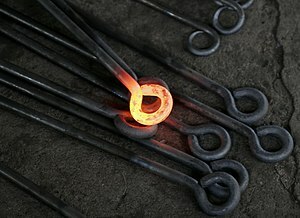 A metal is a chemical element that is a good conductor of both electricity and heat and forms cations and ionic bonds with non-metals. In chemistry, a metal (Ancient Greek métallon, μέταλλον) is an element, compound, or alloy characterized by high electrical conductivity. In a metal, atoms readily lose electrons to form positive ions (cations). Those ions are surrounded by delocalized electrons, which are responsible for the conductivity. The solid thus produced is held by electrostatic interactions between the ions and the electron cloud, which are called metallic bonds. An alternative definition of metal refers to the band theory. If one fills the energy bands of a material with available electrons and ends up with a top band partly filled then the material is a metal. This definition opens up the category for metallic polymers and other organic metals, which have been made by researchers and employed in high-tech devices. These synthetic materials often have the characteristic silvery gray reflectiveness (luster) of elemental metals. Metals in general have high electrical conductivity, thermal conductivity, luster and density, and the ability to be deformed under stress without cleaving. While there are several metals that have low density, hardness, and melting points, these (the alkali and alkaline earth metals) are extremely reactive, and are rarely encountered in their elemental, metallic form. Optically speaking, metals are opaque, shiny and lustrous. This is due to the fact that visible lightwaves are not readily transmitted through the bulk of their microstructure. The large number of free electrons in any typical metallic solid (element or alloy) is responsible for the fact that they can never be categorized as transparent materials. The majority of metals have higher densities than the majority of nonmetals. Nonetheless, there is wide variation in the densities of metals; lithium is the least dense solid element and osmium is the densest. The metals of groups I A and II A are referred to as the light metals because they are exceptions to this generalization. The high density of most metals is due to the tightly packed crystal lattice of the metallic structure. The strength of metallic bonds for different metals reaches a maximum around the center of the transition series, as those elements have large amounts of delocalized electrons in a metallic bond. However, other factors (such as atomic radius, nuclear charge, number of bonding orbitals, overlap of orbital energies, and crystal form) are involved as well. When considering the exact band structure and binding energy of a metal, it is necessary to take into account the positive potential caused by the specific arrangement of the ion cores - which is periodic in crystals. The most important consequence of the periodic potential is the formation of a small band gap at the boundary of the Brillouin zone. Mathematically, the potential of the ion cores can be treated by various models, the simplest being the nearly free electron model. A change in temperature (or heat). In the former case, the applied force may be tensile (pulling) force, compressive (pushing) force, shear, bending or torsion (twisting) forces. In the latter case, the most significant factor which is determined by the temperature is the mobility of the structural defects such as grain boundaries, point vacancies, line and screw dislocations, stacking faults and twins in both crystalline and non-crystalline solids. The movement or displacement of such mobile defects is thermally activated, and thus limited by the rate of atomic diffusion. In addition, the nondirectional nature of metallic bonding is also thought to contribute significantly to the ductility of most metallic solids. When the planes of an ionic bond slide past one another, the resultant change in location shifts ions of the same charge into close proximity, resulting in the cleavage of the crystal. Such shift is not observed in covalently bonded crystals where fracture and crystal fragmentation occurs. Other significant metallic alloys are those of aluminium, titanium, copper and magnesium. Copper alloys have been known since the Bronze Age, and have many applications today, most importantly in electrical wiring. while the alloys of the other three metals have been developed relatively recently - chemical reactivity of these metals, requires modern electrolytic extraction processes. The alloys of aluminium, titanium and magnesium are also known and valued for their high strength-to-weight ratios and, in the case of magnesium, for the ability to provide electromagnetic shielding. These materials are ideal for situations where high strength-to-weight ratios are more important than bulk cost, such as in aerospace and in certain automotive applications. The World Bank reports that China was the top importer of ores and metals in 2005 followed by the U.S.A. and Japan . In the specialized usage of astronomy and astrophysics, the term "metal" is often used to refer to any element other than hydrogen or helium, including substances as chemically non-metallic as neon, fluorine, and oxygen. Nearly all the hydrogen and helium in the Universe was created in Big Bang nucleosynthesis, whereas all the "metals" were produced by nucleosynthesis in stars or supernovae. The Sun and the Milky Way Galaxy are composed of roughly 74% hydrogen, 24% helium, and 2% "metals" (the rest of the elements; atomic numbers 3-118) by mass. Frank Kreith and Yogi Goswami, eds. (2004). The CRC Handbook of Mechanical Engineering, 2nd edition. Boca Raton. p. 12-2.